North Boulevard Town Square is a spectacular greenspace development that has transformed the disjointed area between North Boulevard and River Road into a lively downtown center where the city's cultural and civic attractions come together for all to enjoy. While this area was previously unusable with virtually no tree cover to protect visitors from the relentless Louisiana heat, it has now become the city's premier social gathering place — featuring more than an acre of open green space and innovative water features that help cool the landscape and a multitude of high-tech amenities to entertain visitors. Intersections are designed as smooth, curb-less environments that enable safe and easy movement by the elderly, disabled, very young, and large crowds. Water features around a media Beacon and along the Town Lawn help cool the spaces during the day, while bands of light in the pavement softly light the spaces at night. 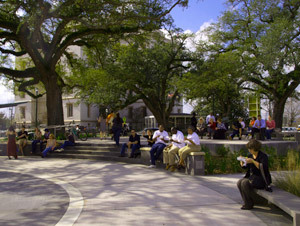 Café seating, as well as benches and game tables, are provided in the plaza areas. Town Square also serves as the primary transit hub for downtown featuring a covered transit station, and transit information conveyed through real-time GPS and display. The overwhelming success of the project is a direct result of the broad and diverse groups that came together to support its development. 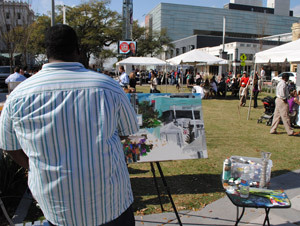 In total, more than two dozen government agencies, businesses and civic/community organizations, contributed to the design and vision for North Boulevard Town Square, some of which include: the Mayor's Office, East Baton Rouge Parish Metropolitan Council, Downtown Business Association, Baton Rouge Area Chamber of Commerce, Baton Rouge Area Foundation, Center for Planning Excellence, the Recreation & Park Commission, numerous state government entities, two public universities and several local neighborhood associations. As downtown's premier public space, Town Square is activated weekly with a wide variety of family friendly events. Check the Town Square event calendar for more information on what great events are planned such as movies on the lawns, free concert series, and festivals. Parts of the Town Square are available to the general public for special event use; including weddings, concerts, corporate functions, markets, and more!